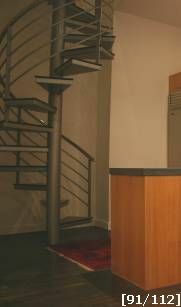 This spiral staircase is a 60" diameter, 4 line system with mahogany overlay on the treads. Going up on level, this line rail system spiral stair uses a 4" O.D. Scd. 40 pipe, with 3/16" thick plate treads welded to it. 1" thick mahogany overlay cap off the spiral step, and also tie the stair in to its surrondings. Spiral rail system incorporates 1 1/2" round top rail w/ 3/4" round intermediats, all welded to 2" x 1/2" flat bar posts.